Joyce Malcolm illuminates the historical facts underlying the current passionate debate about gun-related violence, the Brady Bill, and the NRA, revealing the original meaning and intentions behind the individual right to “bear arms.” Few on either side of the Atlantic realize that this extraordinary, controversial, and least understood liberty was a direct legacy of English law. 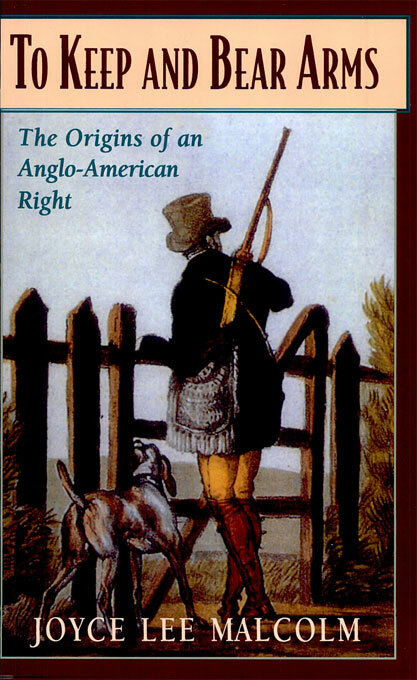 This book explains how the Englishmen’s hazardous duty evolved into a right, and how it was transferred to America and transformed into the Second Amendment. Malcolm’s story begins in turbulent seventeenth-century England. She shows why English subjects, led by the governing classes, decided that such a dangerous public freedom as bearing arms was necessary. Entangled in the narrative are shifting notions of the connections between individual ownership of weapons and limited government, private weapons and social status, the citizen army and the professional army, and obedience and resistance, as well as ideas about civilian control of the sword and self-defense. The results add to our knowledge of English life, politics, and constitutional development, and present a historical analysis of a controversial Anglo-American legacy, a legacy that resonates loudly in America today.